SAN DIEGO MORTGAGE AND REAL ESTATE: Oceanside Investment Properties: Foreclosure Tours ? 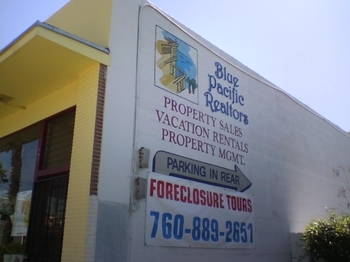 Oceanside Investment Properties: Foreclosure Tours ? I'm bullish, long-term, on coastal California real estate- that's no secret. The underlying demographics are still positive for California; more people will be moving in than moving out, over the next 20 years. Aging baby boomers yearn for warm climes in retirement. While California has its share of problems, it is still the "promised land" for many Americans. Southern California is getting hammered. Housing prices in San Diego County have dropped like a ball off a table. While tony communities like La Jolla and Rancho Santa Fe have held up, towns like Oceanside have experienced severe declines. Two "beach towns" we like, in San Diego County, are Oceanside and Imperial Beach. We're "value investors" and have been since our days on Wall Street. Benjamin Graham and Warren Buffett "speak" to us. We regard California beach towns as "blue chip" stocks. Today, thos "blue chips" are becoming affordable. My daughter's theatrical debut, at The Star Theater, affords me a Saturday afternoon in Oceanside. As I looked out the window of the Jitters Cafe (free wireless), I saw THIS sign. I had to snap a picture of it! While Hollywood HIlls offers a "tour of the stars' homes", Oceanside offers a tour of foreclosed homes. I don't begrudge the REALTOR a little creative marketing; in this market, a "foreclosure tour" is appealing to value investors. The waters are clearing as we apply the financials, to some of the offered homes, in Oceanside.